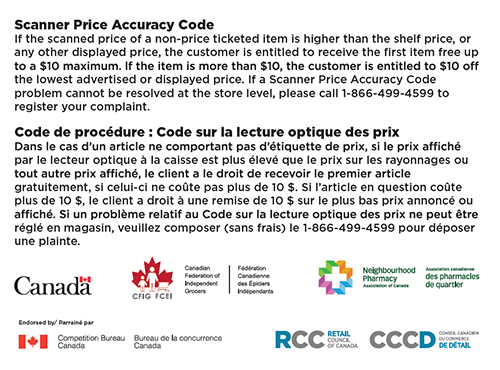 On behalf of Canadian retailers, RCC manages the Scanner Price Accuracy Code. To file a complaint under the Scanner Price Accuracy Code, please contact: 1-866-499-4599. Canadian retailers are committed to accurate scanner pricing. Incorrect prices can result in poor customer relations and legal sanctions. Consequently, many retailers are now implementing a variety of procedures that were developed to help achieve and maintain accurate scanner pricing. The Scanner Price Accuracy Voluntary Code (“the Code”) evolved from the collaborative efforts of Retail Council of Canada (RCC), the Neighbourhood Pharmacy Association of Canada and the Canadian Federation of Independent Grocers (CFIG). These associations are composed of national, regional and local retailers selling a wide assortment of general merchandise, as well as pharmaceutical and food products. This diversity in the Canadian retail environment underscores the advisability of a voluntary code that can be widely used. The Scanner Price Accuracy Voluntary Code has been endorsed by the Competition Bureau. Provide the retail industry with a mechanism for consumer redress in scanner price accuracy cases, to be managed by the industry through an industry committee. The Code applies to all scanned Universal Product Code (UPC), bar coded, and/or Price Look Up (PLU) merchandise sold in stores, with the exception of goods not easily accessible to the public (e.g. prescription drugs and behind-the-counter cosmetics), and individually price-ticketed items. The Code does not apply in provinces or territories where existing legislation or regulation covers these concerns. A retailer adopting the Code must abide by the policies outlined below. (b) if the correct price of the product is higher than $10, the retailer will give the customer a discount of $10 off the correct price. 1.2 Where the same error recurs in scanning multiple units of a given product during a given transaction, the retailer will correct the scanning error in respect of each unit of the given product purchased, but is obliged to apply the policy set out in 1.1 (a) and (b) in respect of only one of the units. 1.3 Paragraph 1.1 only applies after the final sale price of the purchased item has been displayed at the checkout, including relevant rebate, discount or promotional coupons. 1.4 To be eligible for the Item Free Scanner Policy, the product must match the product description on the corresponding shelf tag. 1.5 The Item Free Scanner Policy does not apply if the barcode or shelf label for a given product has been tampered with. (b) does not permit the retailer to offer a discount or a rebate. 1.7 The Item Free Scanner Policy does not apply to a product that government legislation or regulation does not permit to be provided free or below a minimum price. 2.1 Once a scanner pricing error is brought to the attention of the retailer, appropriate steps should be taken as quickly as possible to correct the source of the error. 2.2 When a retailer cannot immediately correct a scanning error in respect of a product, it will post a correction notice in a conspicuous place. Once such a notice has been posted, the Item Free Scanner Policy is no longer in effect in respect of the relevant product. 3.1 All retailers will apply the Code, consistent with the philosophy and intent. In situations where retailers believe that customers’ requests are beyond the Code’s intent, these situations will be discussed with sponsoring Associations to ensure consistent application and remedies. 3.2 Retailers will establish appropriate internal policies and procedures for maintaining a high level of scanner price accuracy. 3.3 Retailers will display the sign attached hereto as Attachment 1 at all store entrances or in a conspicuous location near the store entrances. Retailers will display the sign attached hereto as Attachment 2 at each checkout station within their stores. 3.4 Retailers will train staff on the Code generally and the Item Free Scanner Policy in particular. 3.5 Retailers will have copies of their current advertising material (e.g. flyers, etc.) available and readily accessible for customer reference. 4.1 For those products that are not individually price-ticketed, a clear and legible label must be affixed to the shelf next to the product. 4.2 The shelf label (peg label, basket label) must contain an accurate description of the item and shall include the price of the item or, where the item is sold at a price based on a unit of measurement, the price per unit of measurement. 4.3 The price on the shelf label must be in at least 28-point bold type print, and product description in at least 10-point type print. 4.4 A sign for a given product within the retailer’s premises which is not displayed with that product (i.e., is displayed elsewhere within the retailer’s premises), shall comply with the minimum requirements described above and be at least 38.71 sq. cm in size. 6.1 A Scanner Price Accuracy Committee (“the Committee”) will be created to review the Code on an annual basis and to recommend required amendments. The Committee should be composed of representatives of the Neighbourhood Pharmacy Association of Canada, CFIG, RCC and the Consumers’ Association of Canada (CAC). 6.2 The Committee should be responsible for keeping the Code up to date. 6.3 The Committee should meet at least twice a year in order to supervise national implementation of the Code and consider any recommended changes to it. (c) recommend ways of resolving the complaint and provide relevant direction to the appropriate contact person. 6.5 The Committee shall prepare an annual report for the Competition Bureau concerning the number of complaints received and their resolution. 7.1 When a scanner price error occurs, the cashier will be authorized to implement the Item Free Scanner Policy. 7.2 A customer dissatisfied with the cashier’s decision will be directed to the store manager or supervisor. 7.3 If the store manager or supervisor cannot resolve the dispute, the customer should be directed to a designated company representative. 7.4 The time period for considering a particular complaint should be left to the discretion of the retailer. However, generally complaints should be resolved as expeditiously as possible and, in any event, no later than one month after the error is alleged to have occurred. (b) if the dispute remains unresolved it may, at the request of either party, be referred to a designated arbitrator on a cost recovery basis.